There are all sorts of reasons to buy a car. Under most circumstances we will be using it for our comings and goings. From the most basic grocery getter to the most exquisite supercar, we want to drive it. But we also want them to look beautiful, as beautiful as possible for as long as possible. Without any protection, a car's finish will take abuse from rocks, salt, insects and other road debris. We've seen unprotected cars with as little as 15K miles need their front end repainted. Thankfully we have the best options available to properly protect that brand new car and keep it beautiful for years before any damage can occur. 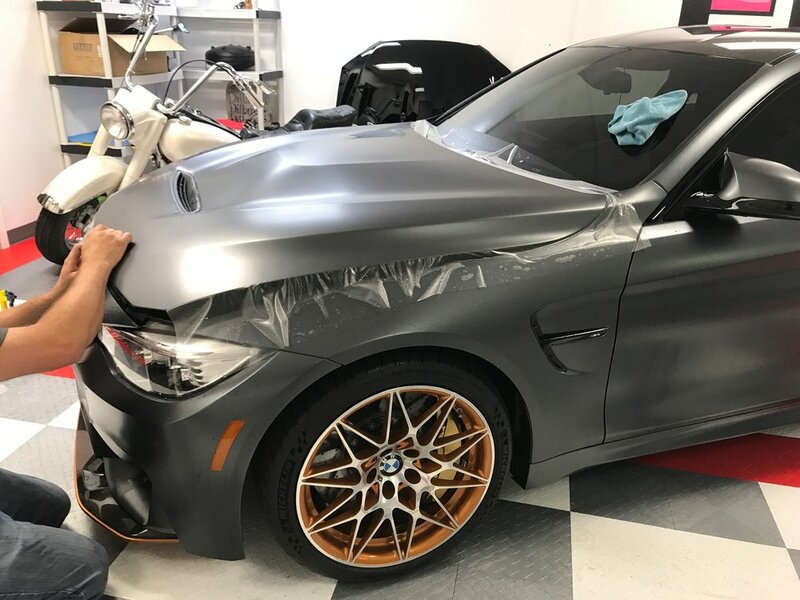 Paint Protection Film, also referred to as Clear Bra, is a thin, nearly invisible film that provides significant protection to your vehicles painted surfaces. It is most commonly installed on the front end where the most damage tends to occur but it can be installed on the entire car for a near seamless and glossy protection from anything the world may throw at it. This will not only ensure the vehicle will retain it's highest resale value but more often then not, your vehicle will fetch more money because of the upgrade of protection film. SunTek Ultra has an industry leading 10 year warranty. It is guaranteed to not stain, discolor, crack or peel for 10 years! We have also found it to be far superior in terms of optical clarity and gloss. It has unmatched self healing and stain resistance and it is 100% engineered and manufactured in the US in order to ensure the highest quality film available anywhere! We know you will be blown away with the look and performance of SunTek Ultra that's why we offer a complete satisfaction guarantee. We also have SunTek Matte PPF available for factory finished matte or satin vehicles. Headlights and fog lights as applicable. Please contact us to set up a consultation to determine pricing for your particular vehicle.